In 2017 I made a life-changing decision to leave the San Francisco Bay Area and move across the country to Raleigh, North Carolina. There is so much that goes into planning a cross-country move, from finding a place to live to figuring out how to get you and your stuff from coast to coast. Figuring out how to get my two cats, Charlie and Clancy, from California to North Carolina was the challenge that I worried the most about. I considered flying across the country with my Boys: however, this was before the latest round of incidents that caused airlines to restrict pets flying in the cabin, which is the ONLY way my Boys will fly. My Boys are my family and there is no way I will transport them where I can’t monitor them myself, so putting my furkids in a cargo hold is a hard no for me. Airlines generally have a one pet per passenger rule. Having to buy an additional ticket so I can bring both cats together was cost-prohibitive. There is only one direct flight between the Bay Area and Raleigh and it is always packed (and it’s on an airline that I long ago vowed to never fly again). Having to change planes introduced too many possibilities for something to go wrong during the trip: weather issues causing a missed connection, requiring rebooking; getting bumped from a flight (especially changing planes from a 737 to a commuter jet). Getting my car across the country. Do I drive the car, then fly back and pick up my cats? Do I fly them out, then leave them with a sitter for a week while I come back for my car? In the end I decided that the three of us would stick together for the entire move. A week in the car with two cats who hate car trips. I wondered how I was going to pull this off without losing my sanity. 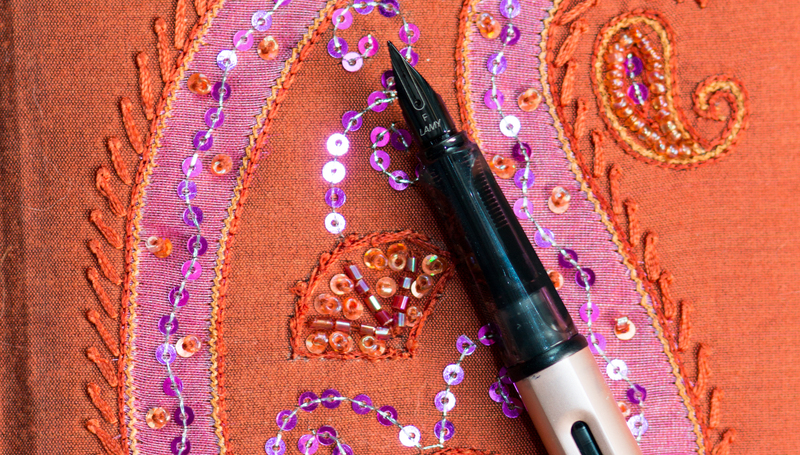 With a lot of planning (and giving your li’l Floofs extra love throughout the process), it is possible to bring your cats on the road with you and maintain your sanity. The very first thing you should do is consult with your cat’s veterinarian. If you haven’t taken kitty in for his check-up recently, it’s a good idea to schedule a visit. You want to make sure that your cat is healthy enough to make a road trip, or get advice on how to accommodate a special needs kitty. You will also need to make sure your cat’s vaccinations are up to date: the state you are relocating to may require documentation showing your cat is vaccinated for rabies. It’s also a good time to stock up on flea treatment. If your cat isn’t chipped, do not leave the vet’s office without one (and make sure you register it). If your cat is microchipped, have your vet check to make sure it is still readable, and when you get home, make sure the information in the registry–especially your phone number–is up to date. Since my cats are indoor-only, neither of them wore collars. However, anything can happen on the road, and not every vet or shelter is equipped with a microchip reader, so I wanted them to have an extra level of identification. We had tried breakaway collars in the past with limited success, so this time I went with Beastie Bands. They are made of neoprene (think wetsuit material), are lightweight, and can stretch enough that a cat can escape if the collar gets tangled on something (each of the Boys have escaped the collar during particularly rambunctious wrestling matches). I bought a pair of them and put them on my cats about 12 weeks prior to our trip, so they would have time to get used to wearing a collar (and not heap ALL of the changes on them at once). One of the issues we had with collars in the past was the dangling tag(s) that bothered the cats, especially when they eat and drink. I searched online and found Boomerang tags. Boomerang has a tag design that doesn’t hang and can be slipped onto a collar. 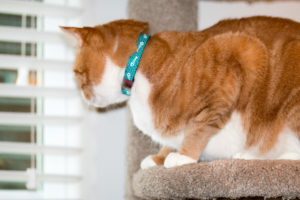 They offer a set that includes the Boomerang collar tag and Beastie Band, so I ordered a set for Charlie and Clancy. These collars are lightweight enough that I have kept them on months after our move. Clancy, modeling his Beastie Band with his Boomerang Tag. I know people that travel with their cats and let them roam free in the car on the road. They made it sound so bucolic: Li’l Floof watches out the window and then settles down on a lap and naps for the rest of the trip. Well, I also know Clancy and Charlie enough to know that, if they’re loose in the car, there’s a 100% chance that both of them will figure out how to get up inside the dashboard in about two minutes. Also, we were facing 3,000 miles worth of unpredictable drivers. There was no question that they would be riding in carriers, mostly for their safety, but maybe a little bit because I didn’t want to have to disassemble my car to pry them out of a hiding place. I had already budgeted for new carriers when I was considering flying them to North Carolina, and even though they would be riding in the car I decided to buy new ones anyway. I bought them about four months before the trip and kept them open in the living room and bedroom for the remainder of our time in the old apartment. I designated these carriers for ONLY the road trip: I kept their old carriers for the vet visits, that way the new carriers would not have an association with going to the vet (I donated the old carriers to the local shelter when we moved). If new carriers are not in the budget, you can scrub out their regular carriers after their last vet checkup and then spritz the inside with a pheromone spray. I struggled with this question as I planned our cross-country move. There are solid arguments for either option. One school of thought is that you don’t want to drug your pet because if he goes into physical distress, the symptoms could be masked by the drugs and you might not realize your cat is in distress until it becomes an emergency. On the other hand, when you have an anxious cat, providing a sedative may help reduce his car anxiety. Charlie would get so anxious in the car that he’d hyperventilate–and the trip to the vet’s office took less than 10 minutes! As much as I’m philosophically anti-drug, if there was even a small chance that a sedative would relax him so he wasn’t panting for 3,000 miles, I would get on board in a heartbeat. So bring this up with your veterinarian. If your cat tends to do all right in the car (a bit of yowling, but no panting or other signs of distress), your cat should be fine without drugs. Your vet may tell you to avoid drugging your cat if he has a medical condition that could be exacerbated by providing sedatives. This is very important to consider if you want to use herbal tinctures, such as Jackson Galaxy’s Stress Stopper or Scaredy Cat blend. Please check with your vet before administering these, so you and your cat aren’t surprised by any reactions. If you decide that drugs are necessary, you should consider administering the first dose and do a test trip BEFORE you begin your long drive. This will let you assess how how well the sedative works (or doesn’t) and your vet can make any needed adjustments before you hit the road for real. You don’t want to be hundreds of miles away from your vet’s office before you discover that your cat reacts poorly to the drug. Clancy and Charlie reacted a little differently to the sedative. Once the drugs got into Clancy’s system he was very relaxed, almost wet-noodle-like. Charlie was still a little more active, however, I only had to chase him around the apartment a couple of times to wrangle him into his carrier (without drugs, this is usually a 15-20 minute process). Both did well on the test drive: Charlie got a little vocal about 30 minutes in, but he wasn’t panting or showing any sign of distress, which was a HUGE victory. Clancy responded to Charlie’s chatter a couple of times, but mostly he napped. On our actual trip, I sedated Charlie and Clancy only for the first two days. The first day it went well: I gave them their sedative in pill pockets when we woke up, so they would have time to take effect while I showered and loaded the car. There was a bit of “conversation” from them during the first drive, but they did really well. The second morning did not go so well: both of them had the pill pockets figured out and would not touch them, even without a pill inside. Plan B was the “pry open the mouth and shove the pill in” method. After 30-40 minutes of wrestling both cats I possibly managed to get one pill in Charlie. I thought I had successfully administered one to Clancy, but found three partially-disintegrated pills on my final sweep of the room before we left. However, both of them did well enough on the drive that day that I decided that trying to pill them was more stress than it was worth. They both handled the remaining car trips like champions. We pet parents are fortunate to be living in an age where the hospitality industry agrees that our furkids are family: many hotels and AirBnB rentals are pet-friendly. But you should still do your research to be sure the place you want to call home for the night is cat-friendly. The Automobile Association of America (AAA) is a great resource for planning travel with your pets. 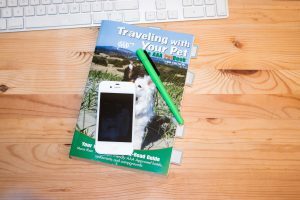 If you have pets and enjoy road trips, I highly recommend their Traveling With Your Pets guide. The guide lists pet-friendly accommodations and restaurants in hundreds of cities throughout the United States. AAA’s guide to traveling with your pet is a great resource for pet-friendly lodging and restaurants. *I originally intended to travel to Asheville, NC, but didn’t find accommodation that fit my budget and was cat-friendly. Once the route was wire-framed, I could figure out where we were going to sleep each night. 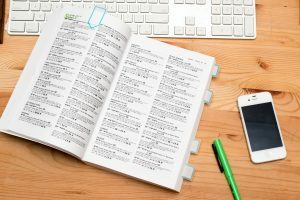 Here is where you need to research accommodations: pet-friendly is not always the same as cat-friendly. I’m not a person who needs origami washcloths and truffles on my pillow: I just want a place for us to sleep that’s reasonably safe and bedbug-free. AirBnB can be an affordable option, and you may find places that are cat-friendly, however I decided against it due to my own discomfort in being in someone else’s home–especially with two cats who are going to be stressed out. 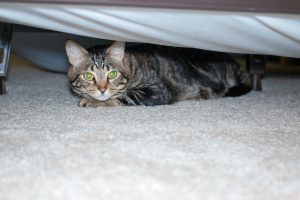 Cats are champion hide-and-seek players and the possibility of having to pull someone’s room apart during a round of Crouching Furkid-Hidden Tabby did not appeal to me. I had a budget of around $100/night, and found that LaQuinta Inn was our best option. It is a cat-friendly chain and they don’t charge an additional pet fee. As I mentioned above, I tried to find accommodation in Asheville, NC that fit my budget, since they didn’t have a LaQuinta. There were pet-friendly places listed in the AAA guide that came close to my budget; however, when I checked the hotel websites, most of them only allowed dogs. I found one large national hotel chain that, at $130 was a bit over my budget, but it allowed cats so I set up a reservation for a pet-friendly room. It was only after I confirmed the reservation that the hotel disclosed the pet fee (it wasn’t in the quote for the room) of $45 PER PET. Please allow me to gripe for a moment: First of all, people who aren’t traveling with pets generally won’t request a pet-friendly room, so anyone requesting such a room should be quoted a rate that includes any additional pet fee. Second, there was NO FREAKING WAY I was paying an extra $90 for one night, especially when my cats and I don’t require $90 worth of clean-up (I was hauling a hand-vacuum AND a bottle of Nature’s Miracle on the trip, so I had their clean-up covered). I cancelled the reservation and back-tracked us to Knoxville, TN, since it had a LaQuinta Inn. Lesson: always do your research! The LAST thing you want to have happen after a long day on the road is to find out that the pet-friendly hotel you reserved doesn’t allow cats. The second-last thing you want is to be hit with a surprise pet fee. Food: Bring enough of their food to cover the time on the road, plus a few extra days (we had a six-day trip planned and I packed ten days’ worth of food). If something happens and your travel is extended, you don’t want to be scrambling to buy food on the road, especially if your cat is on a prescription diet that must be purchased from a veterinarian’s office. Be sure to include their favorite treats! Water: Cats can be frustratingly finicky and will often shun something they have every day if it suddenly tastes different to them. Before we left California, I filled a 2-gallon jug with water from home for drinking and for their food preparation (I add water to their canned food). Two gallons was enough for the trip plus a few days of transition to Raleigh water. It was a taste of “home” and didn’t require them to make yet another sudden adjustment. Dishes: My cats have several sets of ceramic dishes, but I only brought one set in the car with us. For the trip I used paper bowls to make MY life a little easier. I gave them a few meals in the paper bowls before we left, so they would be accustomed to them, but I wanted to keep their regular dishes handy, in case they needed that bit of home along the way. Toys: Bring a baggie with some of your cat’s favorite toys. Include a favorite interactive/wand toy to help you entice your kitty out of hiding. Medication: Refill any prescriptions for medications your cat takes before you move. That way you will have a full supply when you leave and won’t be scrambling to find a vet in your new city to authorize a refill. Litter/litter box: Your cat is going to be spending the next several days in unfamiliar territory. Several of them, in fact. Their litter may be the most important component in helping your cat handle these changes. Although it’s tempting to want to use brand-new litter, your cat will be a lot more comfortable if he has litter with his scent in it. So, as tempting as it is to use fresh litter, make that litter change two or three days before you leave, so your cat has a chance to get his scent worked into it. I was able to make space in our rooftop cargo bin to carry one of their regular litter boxes, so I scrubbed it thoroughly and brought it for the new home. For the trip, though, I bought a smaller, disposable box. Carriers: This is another place you don’t want to skimp on comfort. Put their favorite blankets and beds inside the carrier. Unless the blanket/bedding has been soiled, resist the temptation to wash it immediately before leaving as your cat will feel comfortable with his scent on it. Clancy had become prone to accidents in the carrier (these usually happened within the first five minutes of the trip), so I lined their carriers with pee pads and carried extra garbage bags in case of accidents. Pheromone spray: I sprayed the inside of the carriers and the back seat of the car before our first drive, and again every couple of days during the trip. You might also spray the hotel room before you let the cat out of his carrier, and spray around your new home when you arrive. Paperwork: You should bring your cat’s rabies certificate and have their microchip number and contact information for the registrars. Flea treatment: If you can, it’s a good idea to give your cat a flea treatment a couple of days before you leave. Feeding and medication: You should withhold food and water at least two to three hours before you leave to avoid car sickness and minimize the chances of accidents in the carrier. If you are sedating your cats, you should give them their pills two hours before you leave (or go by the instructions on the bottle). Safety and comfort: Once you have the car loaded and you’re about to close up the old house, spray the pheromone spray in the back seat of the car (or whatever part of the car they will be traveling in). If you weren’t in the habit of buckling the cat carriers into the car before, get into this habit now. On a long trip there are just too many unknowns and too many unpredictable drivers: you don’t want cat carriers launching out of the back seat if you have to stop suddenly or if you get hit. And you’re off! If you’ve done a practice trip (or two) with your cats, you have a good idea of what to expect from them in the car (and they will now have the experience of a car trip that does NOT end up at a vet’s office). With my Boys, I knew from our last trip that they will be zonked out for at least 30 minutes. Around that mark Charlie would usually perk up and start meowing and Clancy would join in soon after. The two of them would have a conversation for several minutes and then they would go quiet for a while. This timeline extended into our trips. With sedation, the car would be quiet for 30-45 minutes before Charlie would start airing his grievances. If your cats do the same, you can play some music softly (cats’ ears are sensitive, so unless your cat prefers it, don’t crank the death metal to 11). There are albums available online that claim to be music for relaxing cats. I don’t know that the music relaxed them, but it kept me from stressing out over the cats’ occasional outbursts. I understood that the yowls were going to be part of the soundtrack of our trip and, as long as I didn’t pick up on distress in them, I didn’t need to respond to each vocalization. Rest and refreshment for YOU: If you are traveling solo with your pets, make sure you’ve packed plenty of snacks and water for yourself, to minimize stops along the way. If you are traveling in the winter, excessive heat isn’t an issue, but in the summer you don’t want to have to choose between securing your car or roasting your kitties, if you need to stop for food. Even if you find pet-friendly restaurants along the way, getting the cat carriers out and buckling them back in again is time-consuming. Stopping for the night: When you reach your lodging, keep the cats in their carriers until you’ve finished unloading the car AND put away any luggage carts and made sure that any open windows are closed. I made the mistake of wanting to get my Boys out of their carriers and give them access to their litter box as quickly as possible: I’d set up the litter box and open the carriers in the bathroom and close the door while I unloaded the car. Charlie happens to be a master at opening doors, especially when he’s determined to patrol the room for better places to hide. (This is what led to our drama in Oklahoma City: he had opened the bathroom door and I decided to not stress him out by trying to wrangle him back into the bathroom.) If you have another human traveling companion, you can let the cats out and have one person keep an eye on them while the other loads/unloads the car, but if you’re the lone human, let them yowl in their carriers for a few more minutes. You never realize how many nooks and crannies there are in a space until you need to find a cat. Here is a short list of places to look in hotel rooms. Room area: inside box springs; under the bed; behind the nightstand (or in it); behind (or in) the dresser; behind the TV; in the closet; on the window sill behind the curtain (remember to check for open windows before you let the cat out of the carrier!). One of the first things I checked once we were settled in the hotel room was the box spring. Ideally, the bed will be on a platform and not on a frame, as this minimizes the area that cats have to rip open the box springs. I ran my hand along the exposed area of the springs to check for any holes. If you find holes, you can plug them up with extra bedding or towels, or you might ask the front desk for a different room. The possibility of needing to move furniture is the primary reason why I prefer hotels to an AirBnB. Hotel staff anticipate the need to shift furniture and are usually willing to help (plus they have a good idea of all the places in the room where a cat likes to hide). An AirBnB host may not be as amenable to you moving their stuff around, even when you do your best to put things back. Cats love hiding under the bed, just out of reach. Cats are driven by routine and now their routine has been shattered. Consider yourself fortunate if you have a cat that can take change in his stride. Neither of mine are like that. For example, Clancy once started to jump on the sofa at home, only to launch himself into a backflip off of it because he saw a different blanket on it. As for Charlie, he tries his best to be a good sport but his face is very easy to read, so I know when he’s feeling distress but trying to put up a brave front. Even though you will be carting them from place to place for several days, your cat can settle into a sense of normal, if you establish a “road routine”. Interactive play: While Charlie and Clancy explored the room, I would hold their favorite interactive wand toy to distract them from their desire to immediately hide. This helped them get comfortable in the room and work up a bit of an appetite (and helped me find hidey-holes to plug). Mealtime: My cats usually split a large can of food at breakfast and a small can at supper. However, I knew that they would likely be freaked out by the car ride and opted to start with the small can after the first trip. This would minimize waste, should they decide they were too upset to eat. At first both Boys made a good start on their canned food…until they heard dogs outside of our room. It took awhile for me to entice them back to their bowls with treats and their favorite kibble. Clancy and Charlie having their first supper on the road. Settling down for the night: Our established wind-down routine consisted of snuggling the kitties on the bed while I composed blog posts and wrote in my journal. Even if I had left them access to a hiding place or two, they usually felt comfortable enough to cuddle. Mornings: In the morning I would feed them first thing (usually some kibble and the small can of food) so they would have time to digest while I showered, had some breakfast, packed, and loaded the car. We weren’t under as strict a timeline in the morning, once I stopped sedating them. As much as possible, I added packing activity into other tasks, so there wouldn’t be a sudden burst of packing to alarm the cats and drive them into hiding. I kept the litter box out until it was time to load the cats into the carriers so they would have ample access as long as possible (Clancy still managed to have an accident a few minutes into our trip on Day Two…oh well). The Boys started getting used to traveling by Day Three and there was less “conversation” from the back seat (and this was without drugs). The only issue we had (other than Clancy soiling his carrier) was going through mountain ranges. The change in air pressure bothered Clancy and he became more vocal as we climbed through the mountains in Arizona and Tennessee/North Carolina. If you notice a similar change in your cat’s behavior, he may be reacting to altitude. Six days after leaving California, we made it to our new home in Raleigh. It wasn’t always easy, but with planning and a lot of extra love to my Boys, we traveled nearly 3,000 miles without killing each other. Now that they are seasoned travelers, I’m even considering planning future trips with them. 1We did have a dramatic evening in Oklahoma City when Charlie went missing. We checked behind furniture, flipped mattresses, looked in every closet, nook, and cranny in the room but couldn’t find him. My worst fear about the trip was coming true: Charlie MUST have somehow got out of the room, even though I was always vigilant when I had the door open. The staff at LaQuinta went above and beyond, checking every hallway on every floor and helping me check every common area. I even walked around the neighborhood several times, fearing he had escaped the hotel completely. My friend, who met us in OKC to finish the trip with us, had mentioned earlier that what looked like a drawer in the nightstand was actually a false front. I suddenly wondered if that meant the inside was solid or hollow, so I went over to pull it away from the wall. Mystery solved: the nightstand was hollow and Charlie had found a little opening in the back and had been chillin’ inside the whole time (I simultaneously wanted to hug him and wring his neck for scaring me). When I informed the staff that we found him–and where–they made a note of this new hiding spot, so all of the staff would be aware of one more place to look for hiding kitties. Excellent and detailed post! Does the one passenger one pet rule have a fee or hidden fee by the airline? In terms of the one passenger/one pet rule, and any fees associated, I would advise people to check with the airline they intend to travel with. After some recent in-cabin incidents, some airlines appear to be revisiting their policy of allowing pets to travel in the cabin. I don’t believe any new restrictions would apply to service animals, but I would expect airlines to really crack down on having service animals fully documented. Great post. I’ve heard that you can go to a psychologist to certify your pet as your emotional support partner and some airlines will let your pet travel for free. Hi Aaron, thanks for your comment! It is possible to have a pet certified as a support or service animal, but my understanding is that getting such certification is harder than it once was. And if you are traveling with two cats, I would imagine that both would require certification and even then the airline might still restrict them from flying in the cabin. Because of their shifting policies, I advise checking with the airline (in fact I say double- and triple-check) when you plan your trip.